But today sitting in freezing temperatures, sipping coffee and remembering some old times does make things warm. I do sound like a granny :P but the fact is I miss home, stuck up in this situation all I do is dream of good old days. And as I was filled with thoughts of home I suddenly remembered Amma's curried Meat balls, quickly called her to get the recipe and here it is. Pressure cook the kheema with 1/4 cup water along with turmeric, garam masala and salt for 4-5 whistles, switch off the stove and let the pressure gradually release. Open the lid check if the meat is cooked and makes sure that all the water has evaporated if not then cook for some more time with lid open. In a non stick pan heat oil saute onions and add ground paste and the keema, mix well and add the remaining masalas (red chilli and corriander powder) let it cook until well combine,check for salt and let it cook completely. Thaw ready made puff pastry sheets for 20 mins and cut into square shapes fill them with 1 tsp meat and cover them binding with little water. Do an egg wash and line on foiled baking tray and bake at 180C for 20 mins or as per puff pastry instructions. 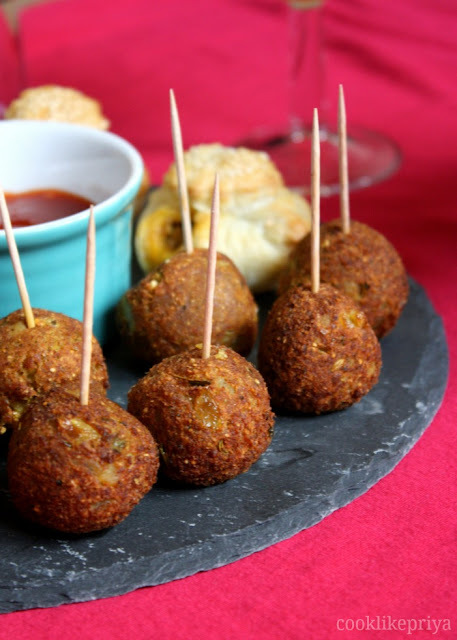 Grind roasted gram dal into powder about 2 tbsp and mix into the keema mix and roll them into firm balls. Lovely clicks and nice presentation. 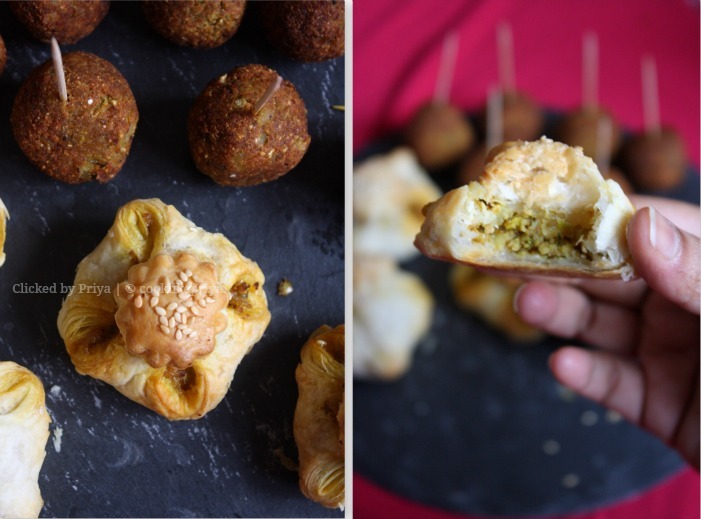 Lovely kheema balls & puffs. Interesting one. Adorable puffs.. Can't wait to try this. 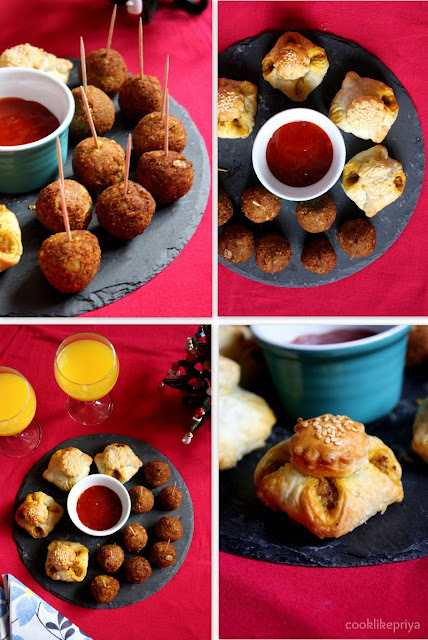 lovely idea...meat balls/puffs looks so appetizing...nice clicks!! 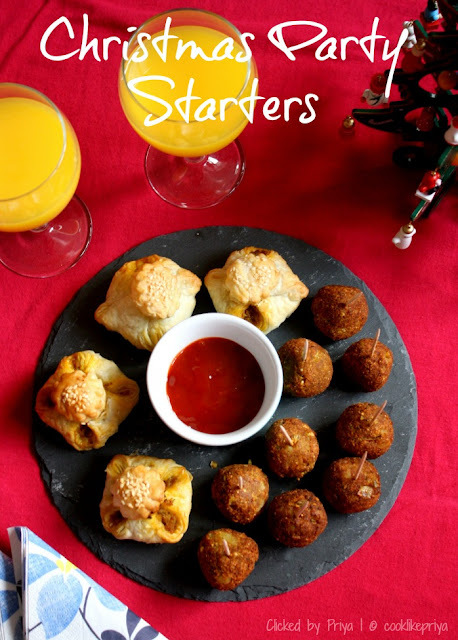 Thank you for the DMBLGIT entry, this platter of party snacks look good! Wow..Priya...I'm drooling for some...shall I take a bite? yummy treat sis.school days are wonderful memories. Firs thing that caught my eye was the interesting shape of the puffs. Anyways love both the dishes with same base.. Can have variety without not much work..
Wow...Celebration is on here...Nice starters Priya. Lovely apperitive food! Both creations look amazing and ever so mouthwatering. Am gonna book my tickets to UK to celebrate xmas with u Priya, can guess how your xmas dinner table will be filled with delicious dishes..Wat do you say,shall i invite myself there:p.
awww that must be superb... Sure Priya aks :) you are most welcome anytime, would love to feast you with more ;) when are you coming??? Very mouthwatering yummy snacks dear. Lovely clicks too. Wow it looks beautiful and yummy! Nice recipe.